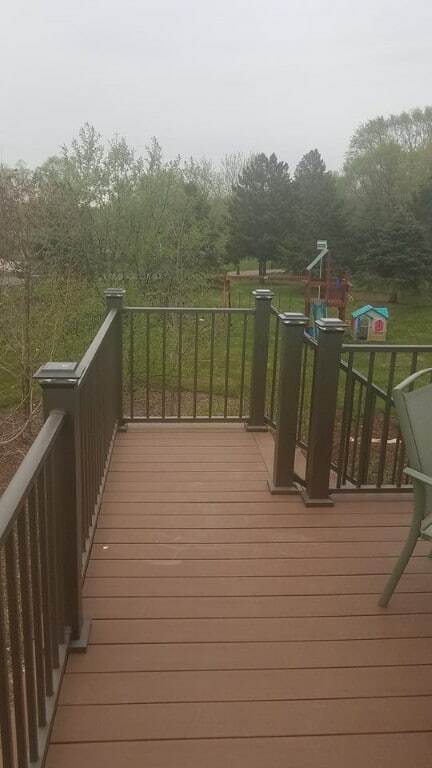 Deck Information: 12' x 16' Green Treated with KDAT Brown Material. 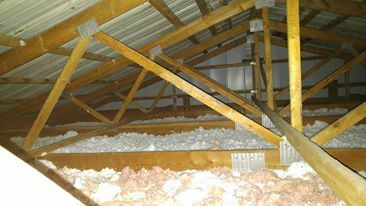 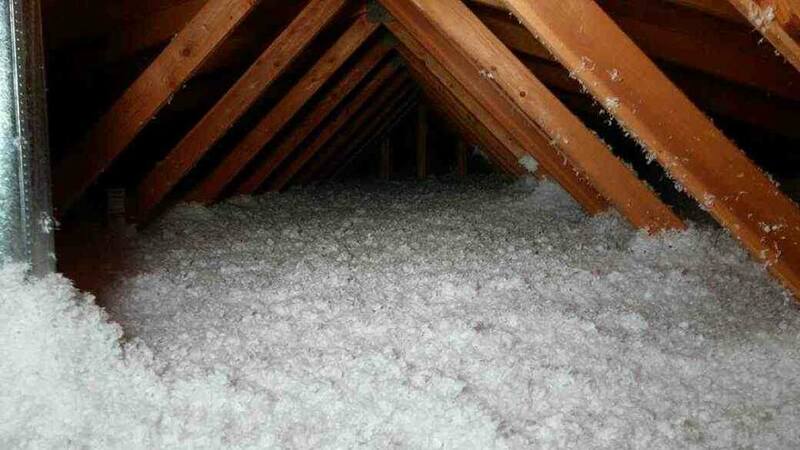 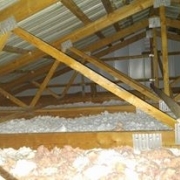 The wood is premium kiln dried to prevent twists and warping. 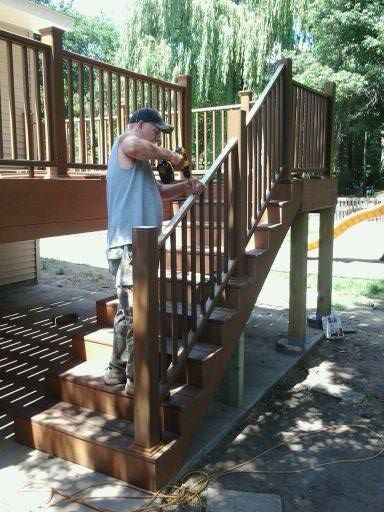 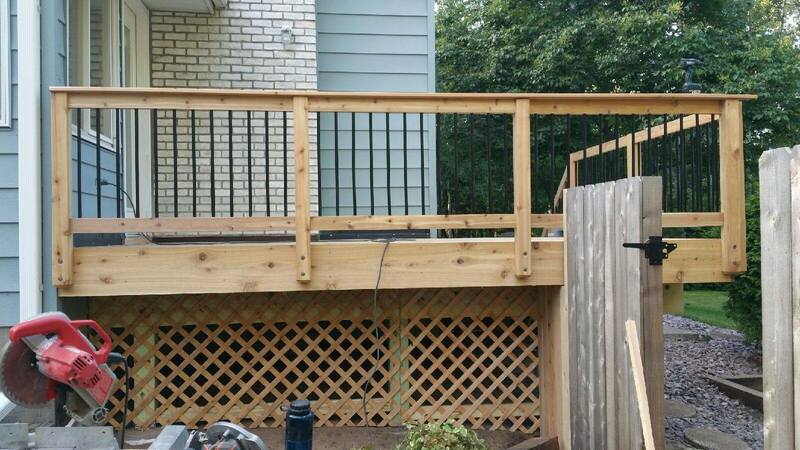 The railing is 4' x 4' post spaced 4 feet with Aluminum Black spindles. 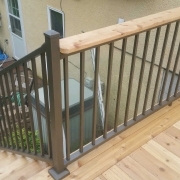 Topped with a beautiful drink rail on top edge for the drinks, wine, beer, pop. 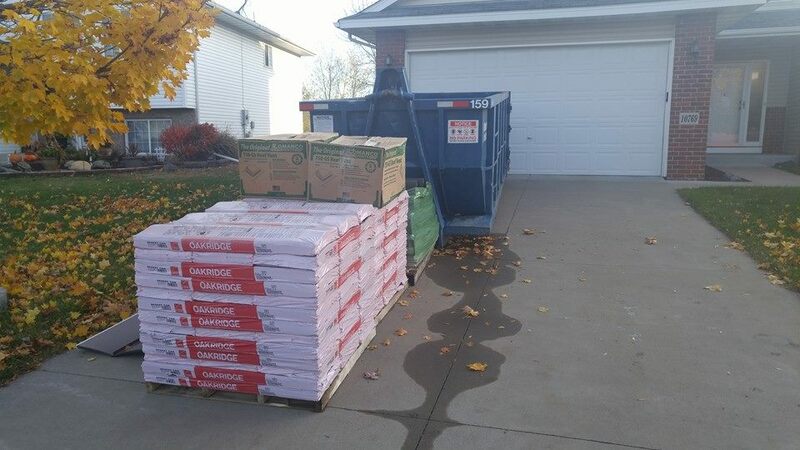 or even food plates. 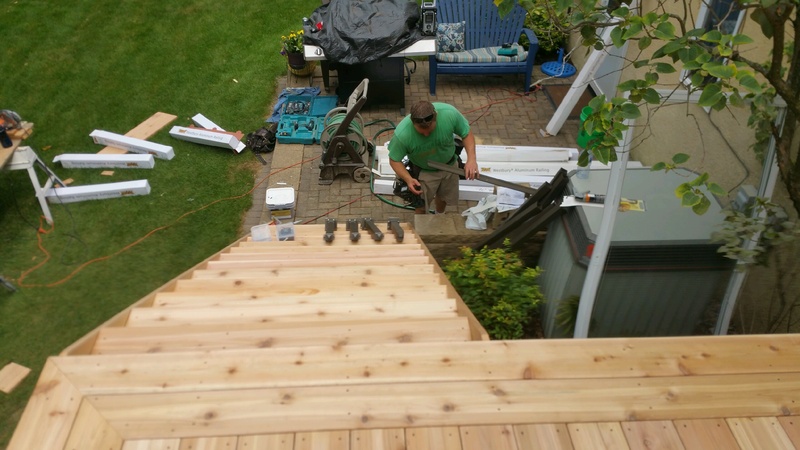 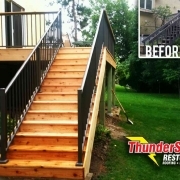 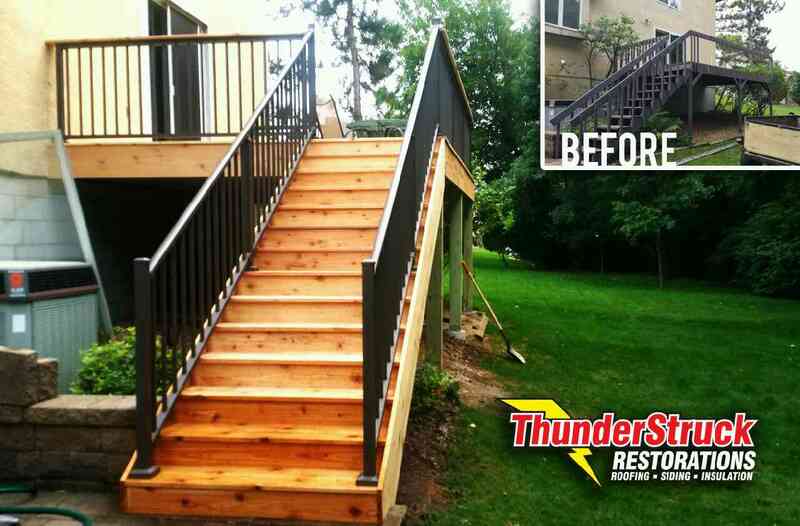 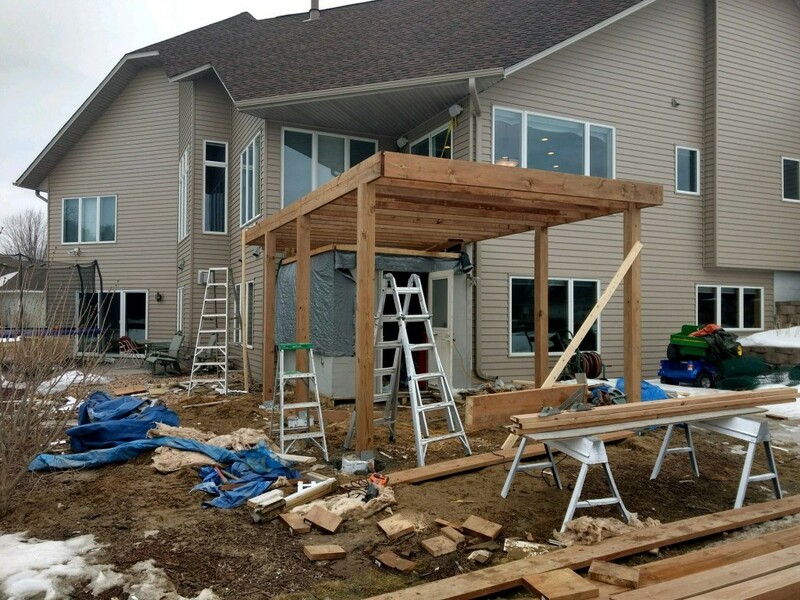 "ThunderStruck recently finished up building our deck. 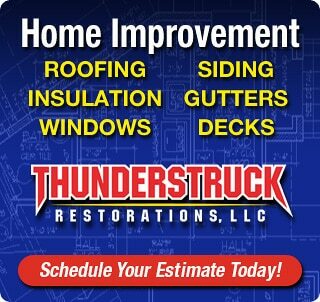 Thunderstruck did a great job! 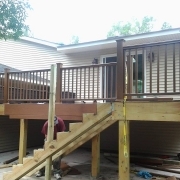 They worked with us on the design and built one solid deck! 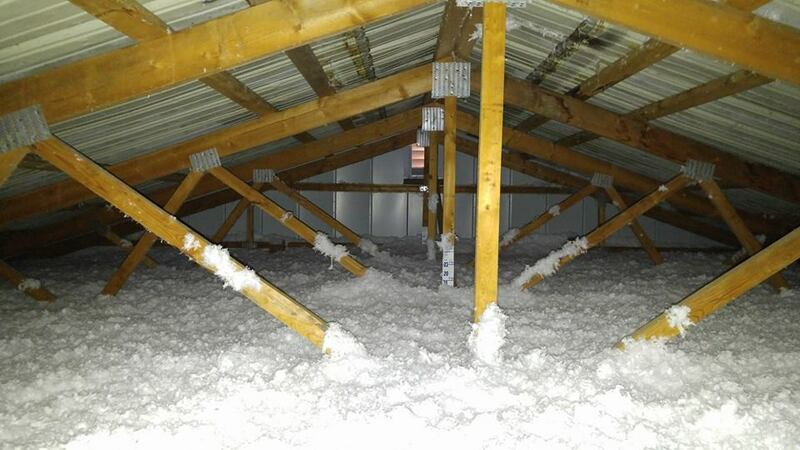 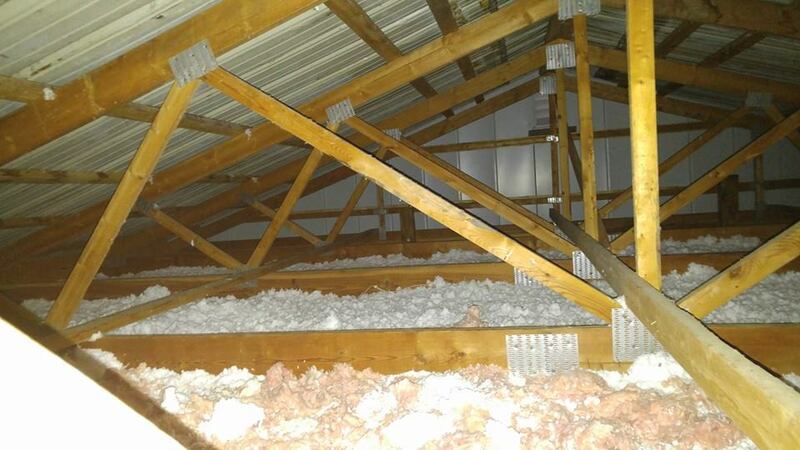 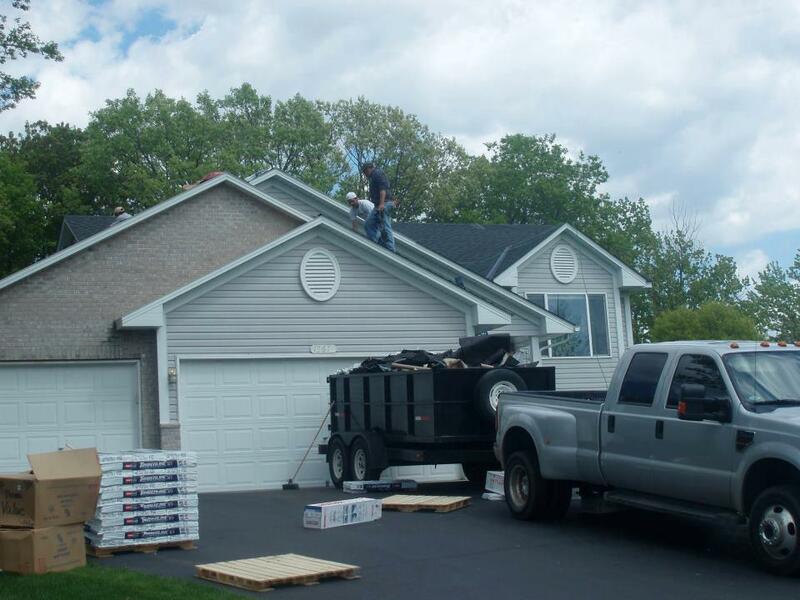 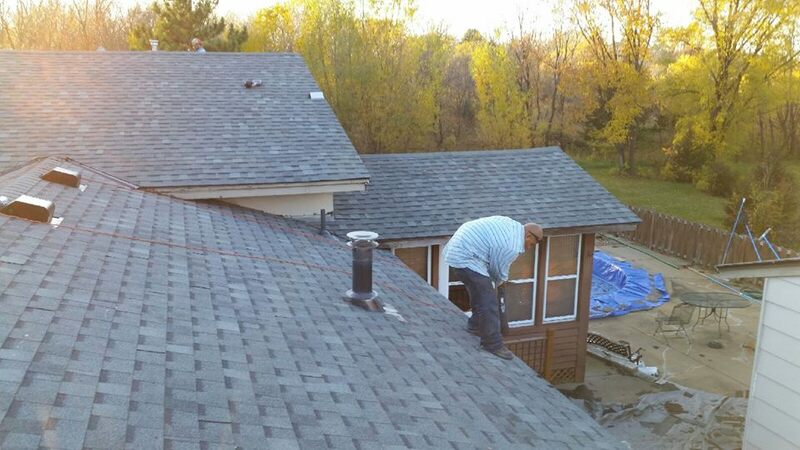 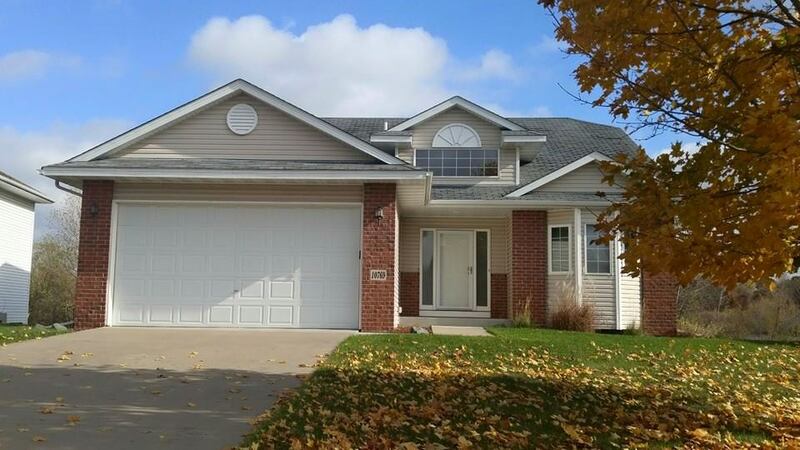 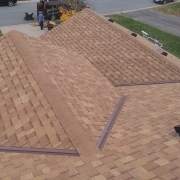 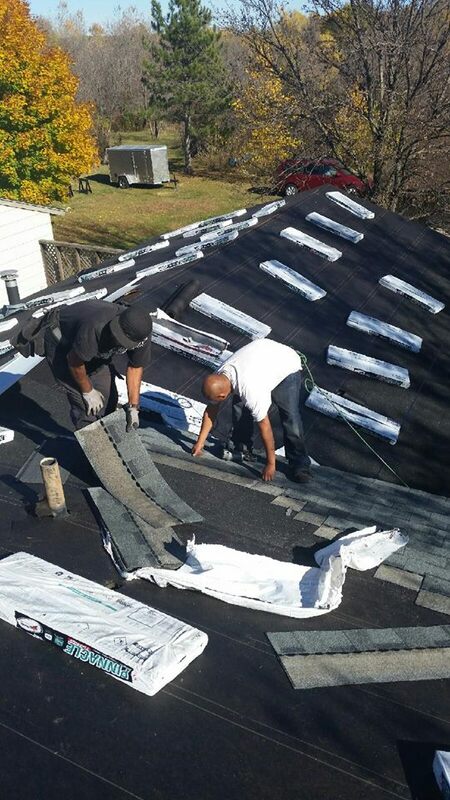 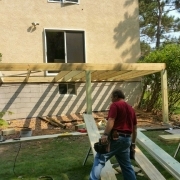 It is refreshing working with a contractor that takes such pride in their work. 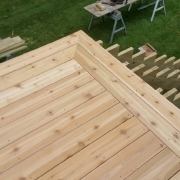 The rest of the team was top notch as well. 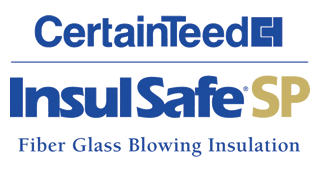 They have earned our trust and we will spread the word. 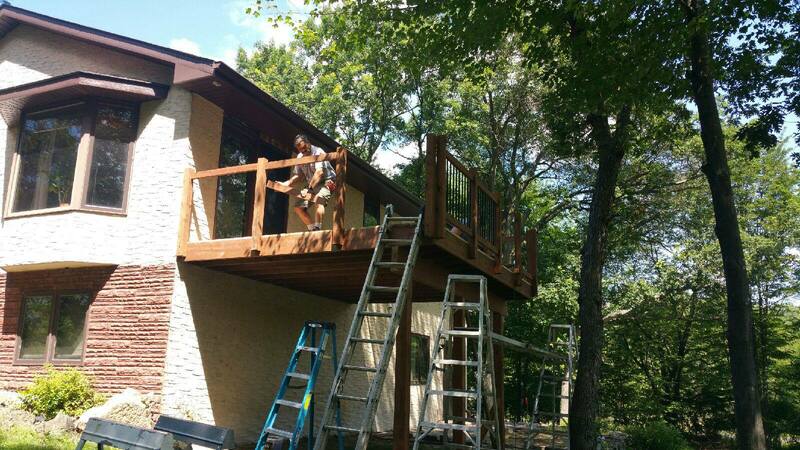 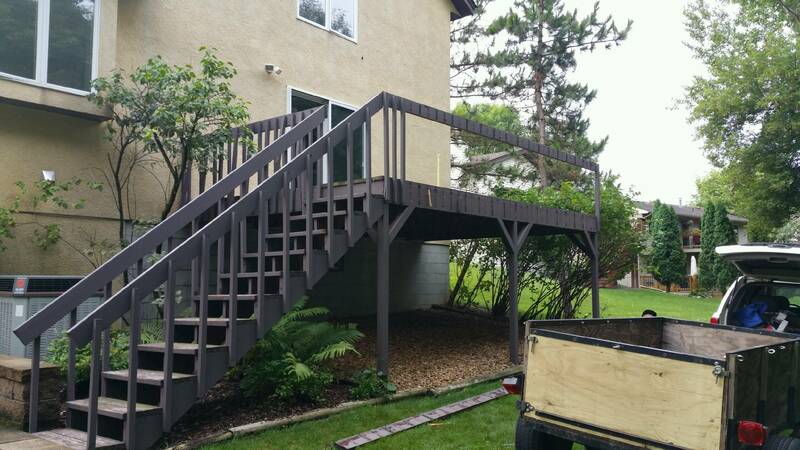 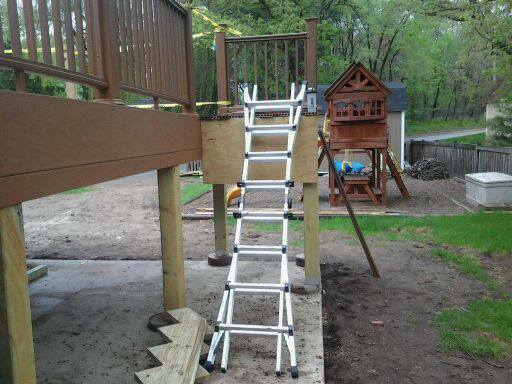 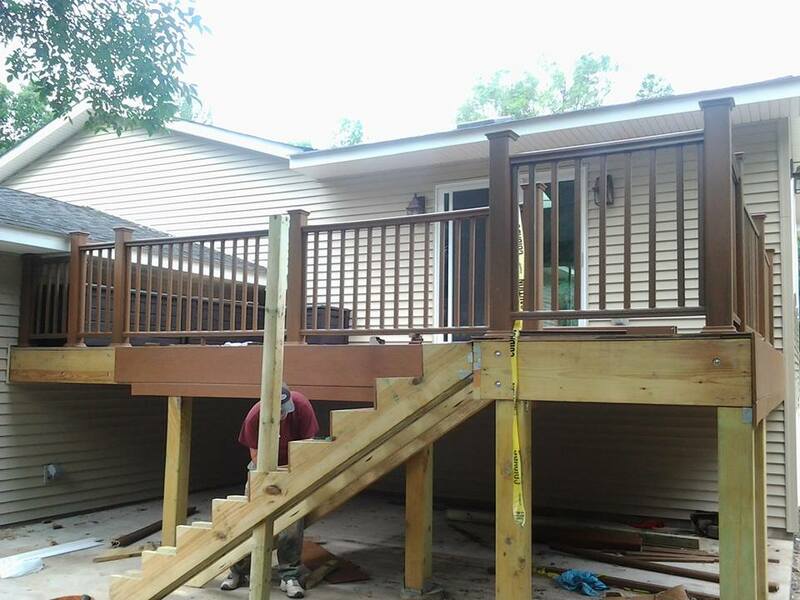 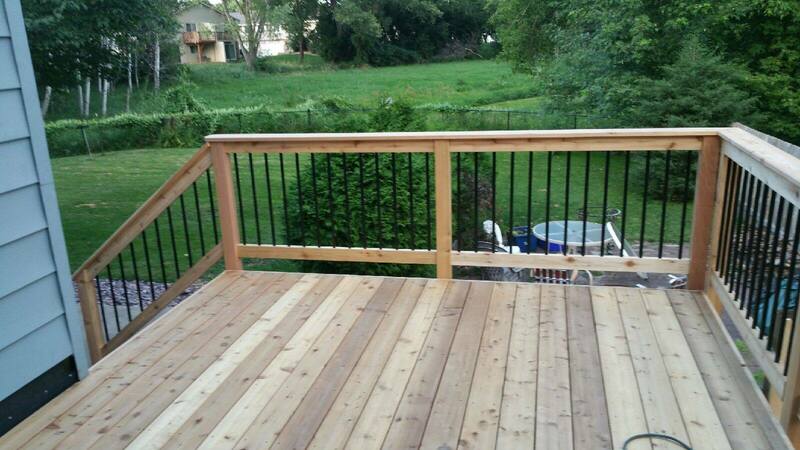 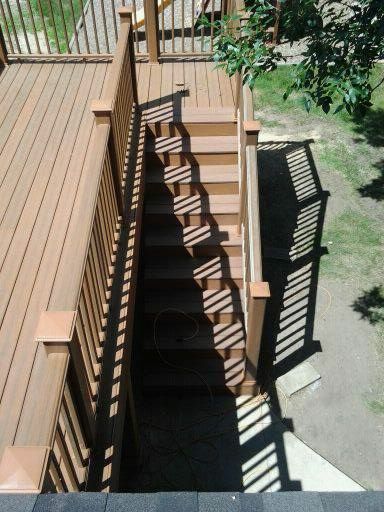 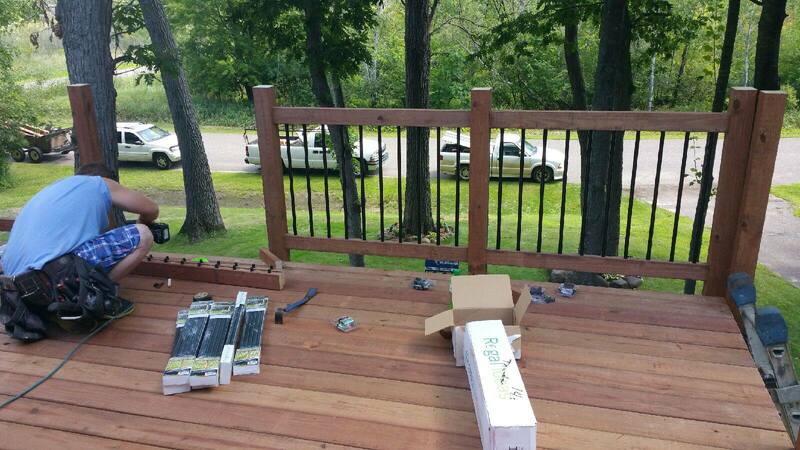 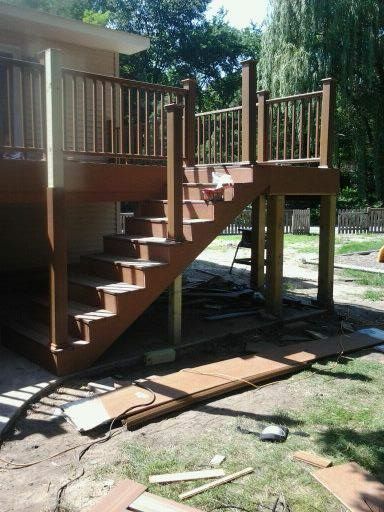 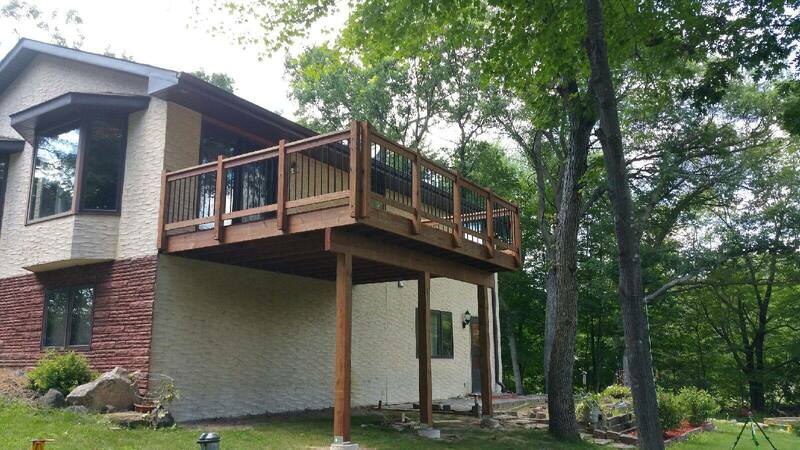 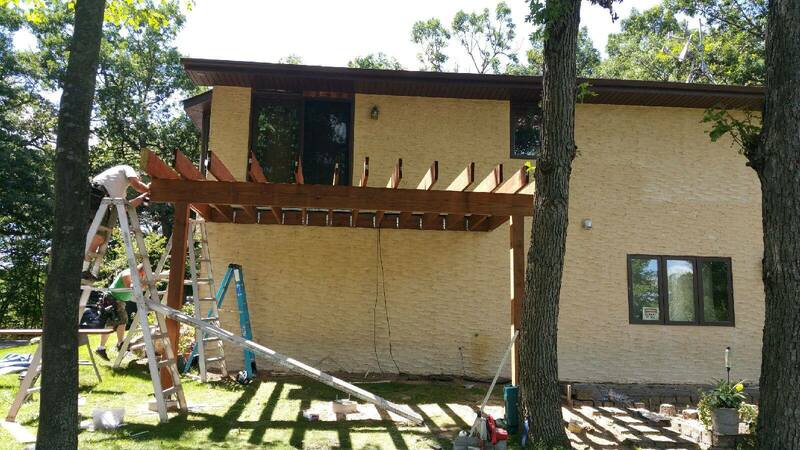 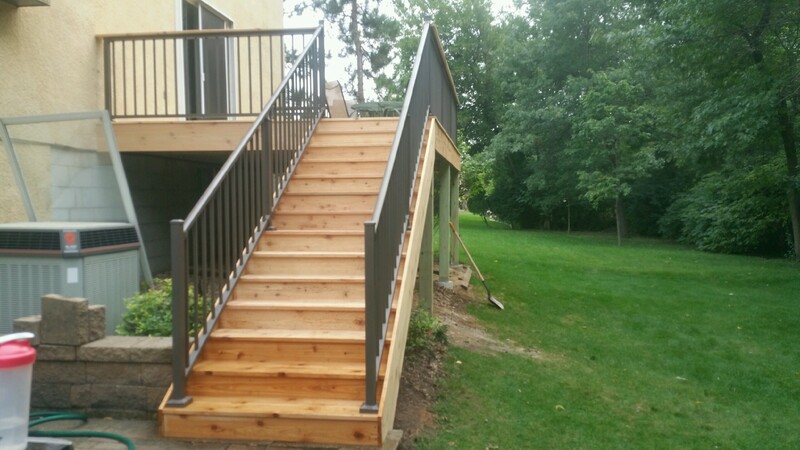 Deck Information: This deck is a 10' x 14' premium cedar deck with black aluminum railing spindles. 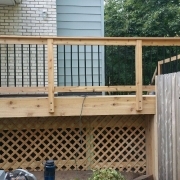 The railing is topped with a 1' x 6" deck board to act as a drink rail to hold drinks and food plates. 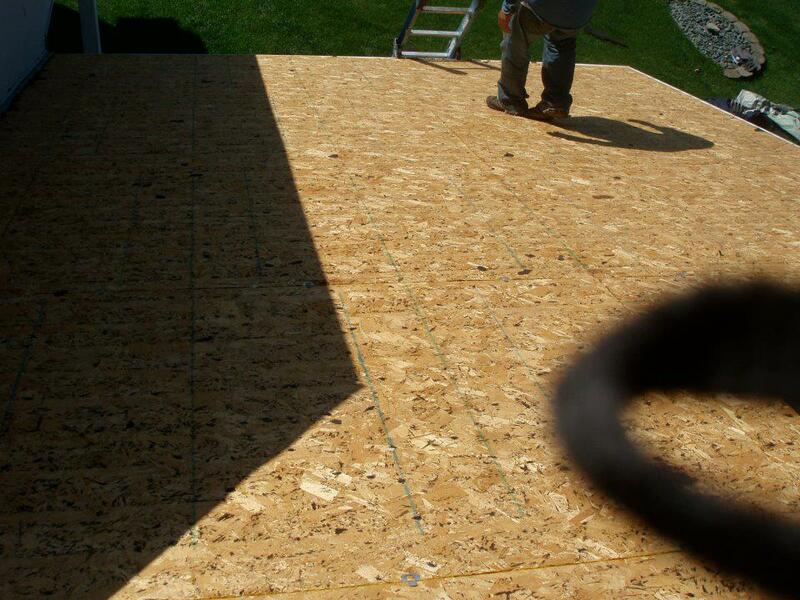 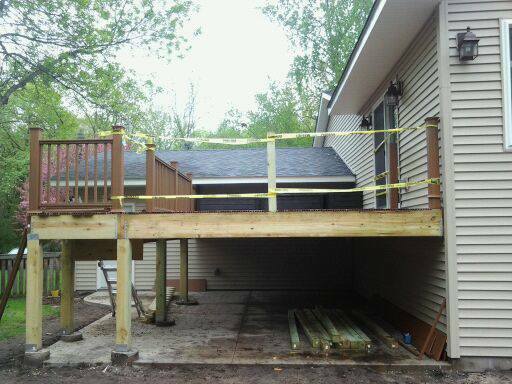 Deck Information: This is a 12' x 18' foot deck. 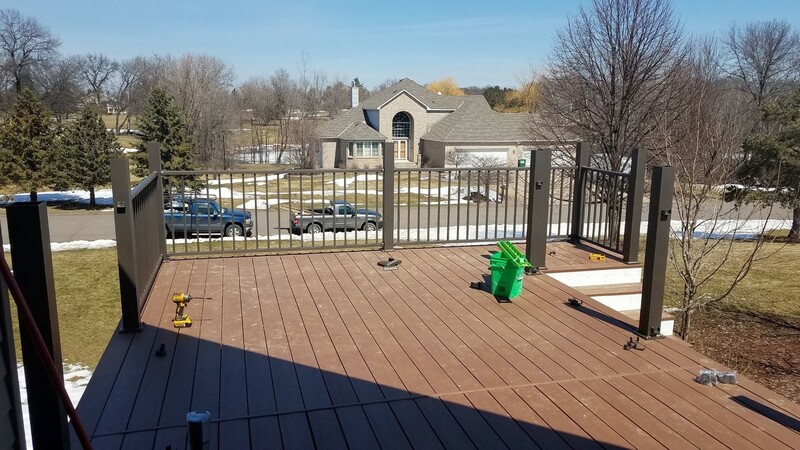 The decking material is premium cedar material with a custom picture frame floor matched with amazing Aluminum C10 Westbury railings in fine bronze color with the Drink Rail adapter kit. 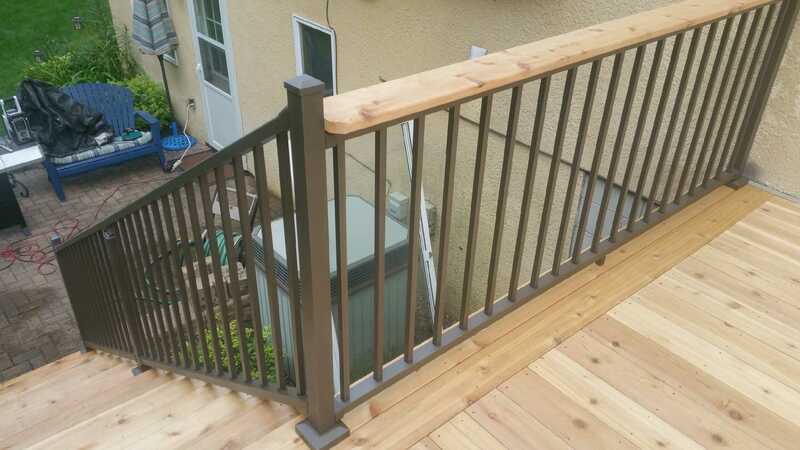 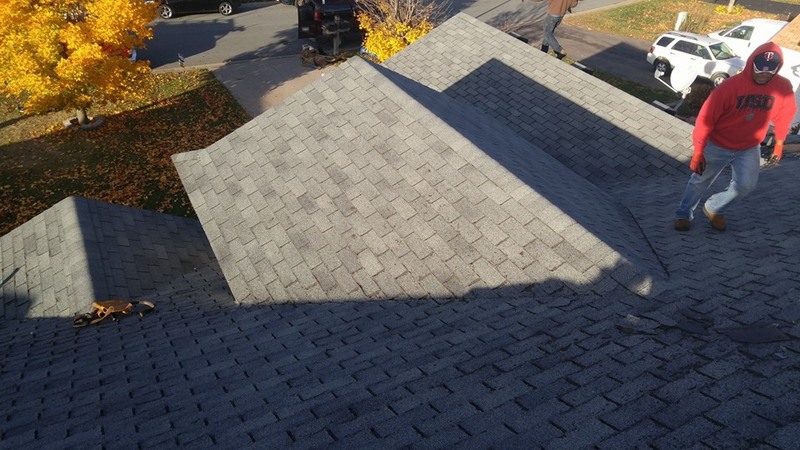 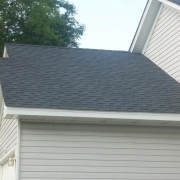 This is special order material that will make your neighbors jealous. 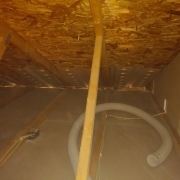 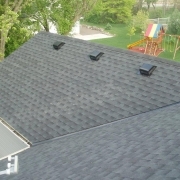 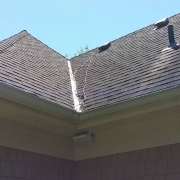 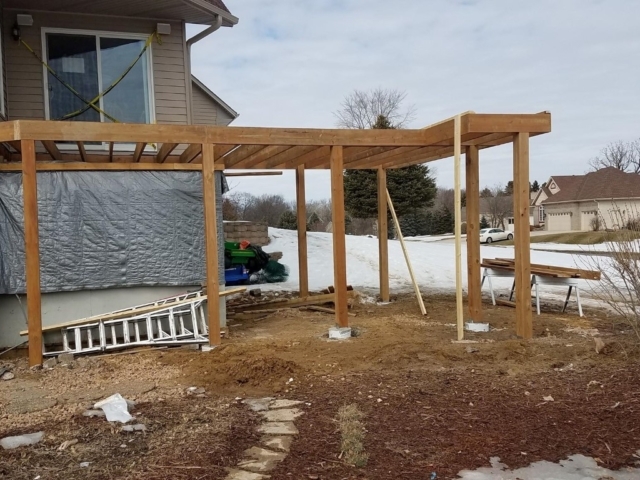 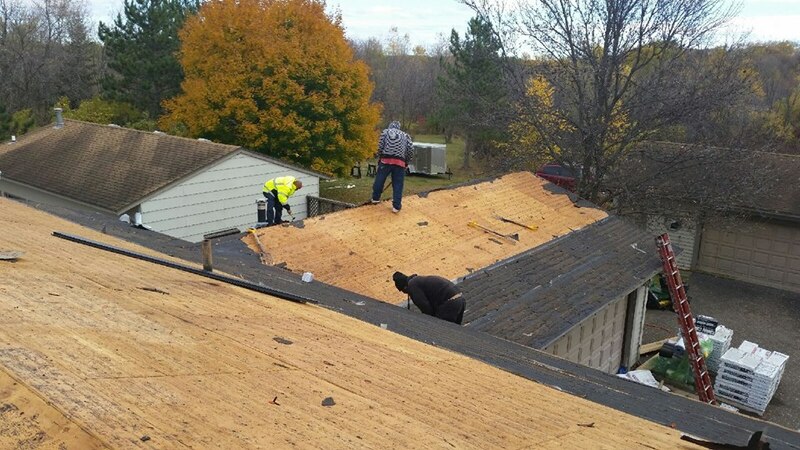 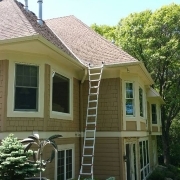 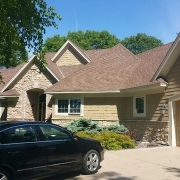 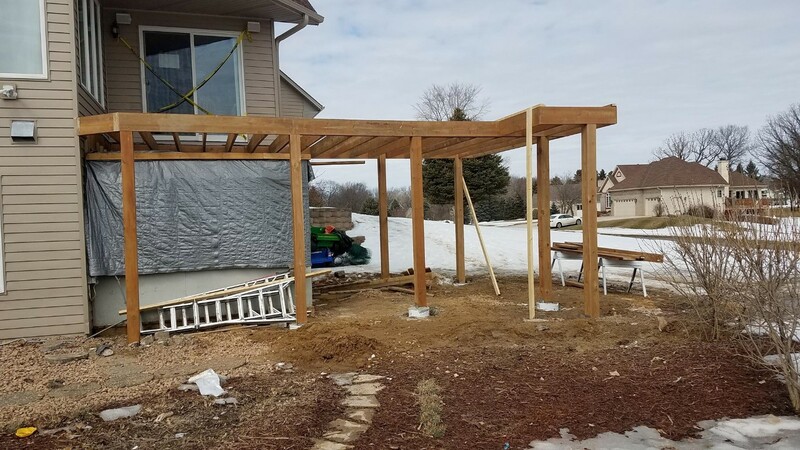 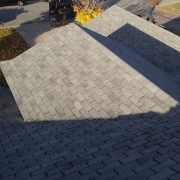 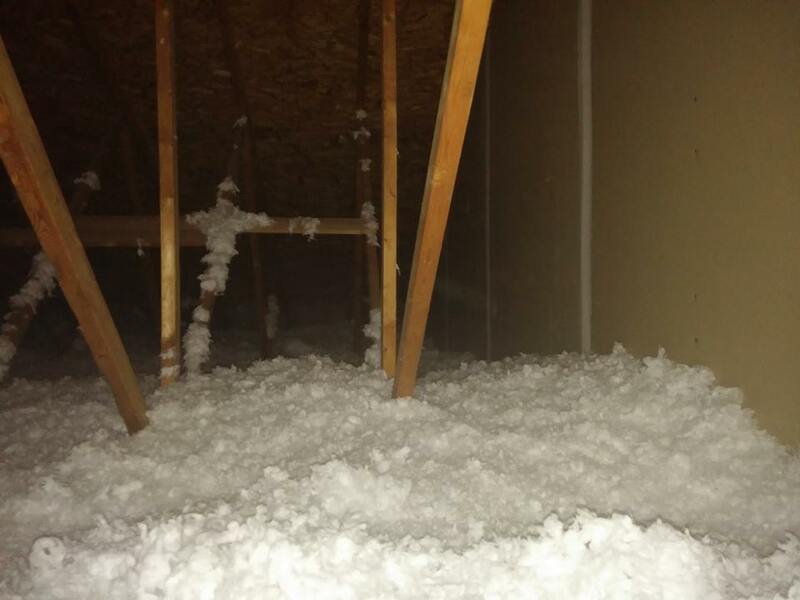 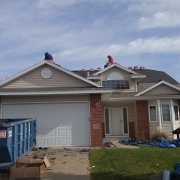 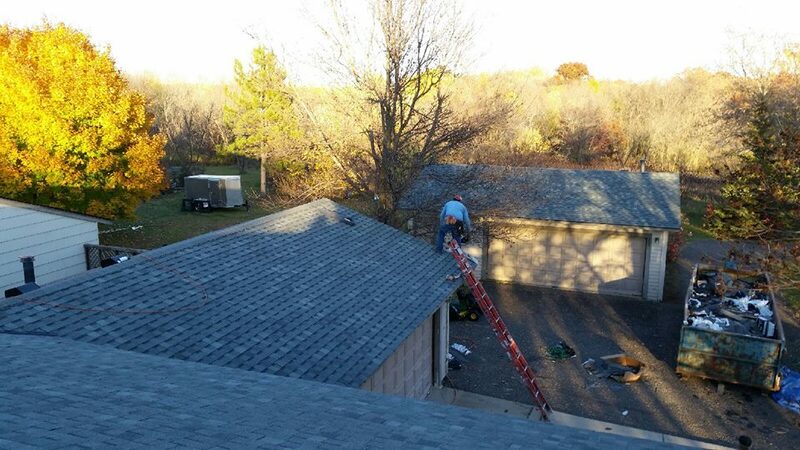 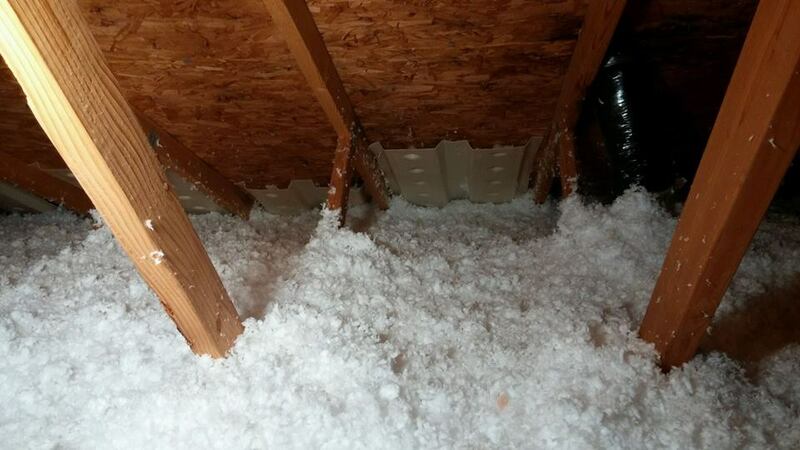 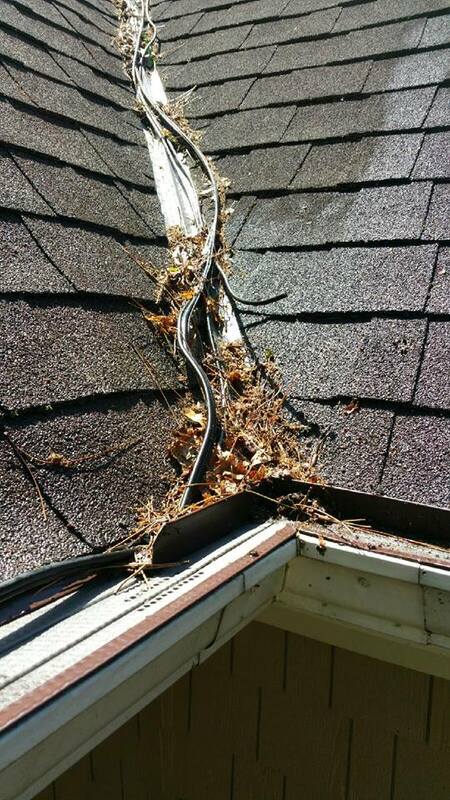 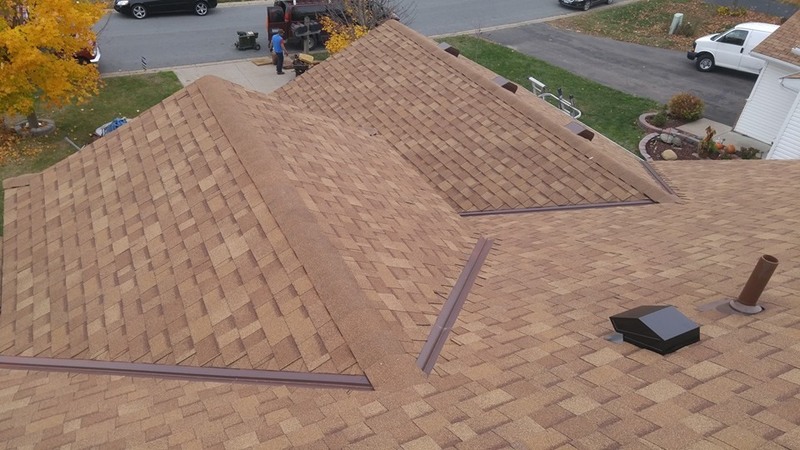 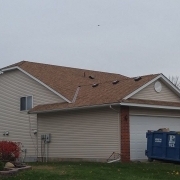 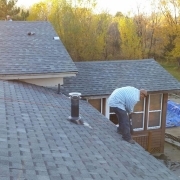 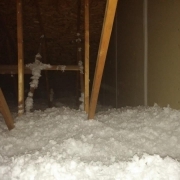 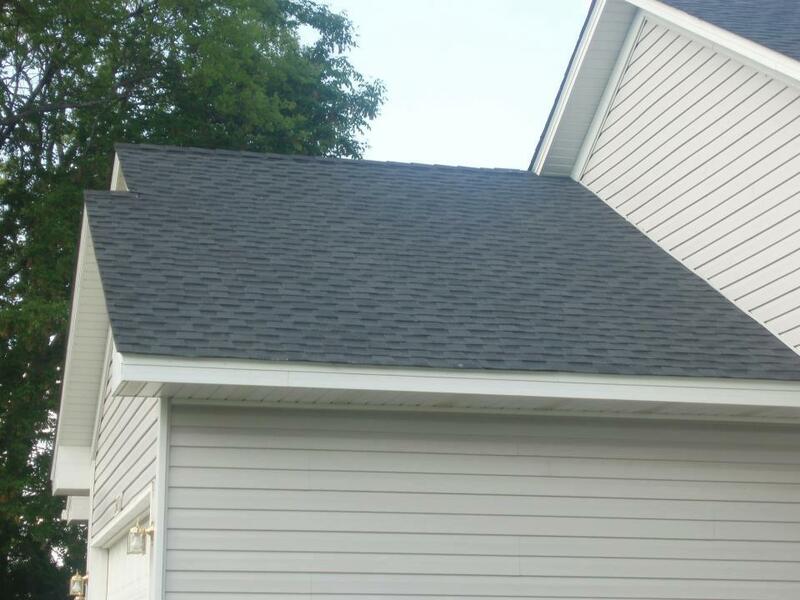 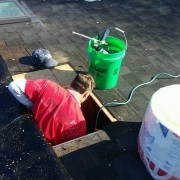 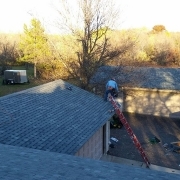 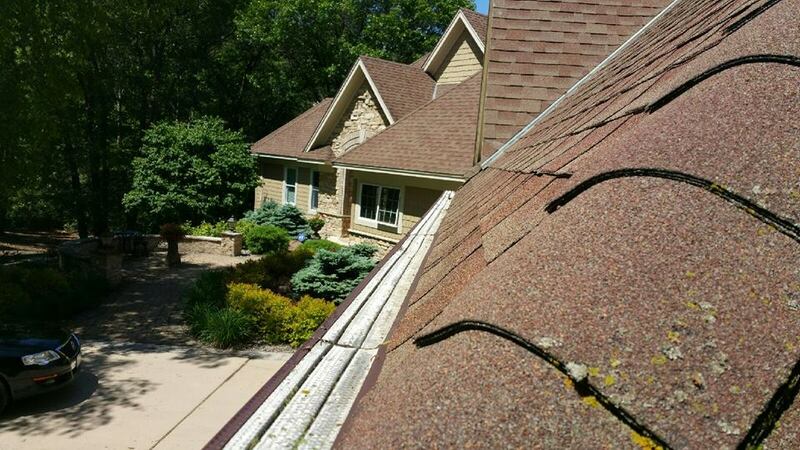 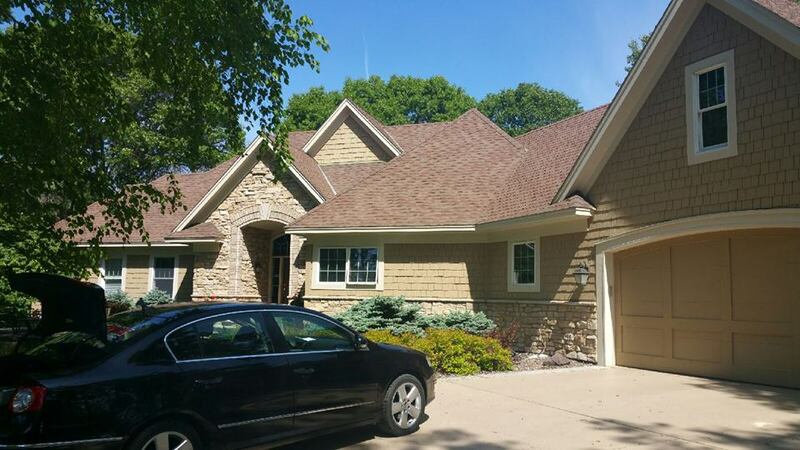 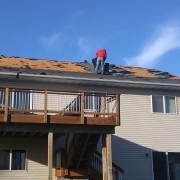 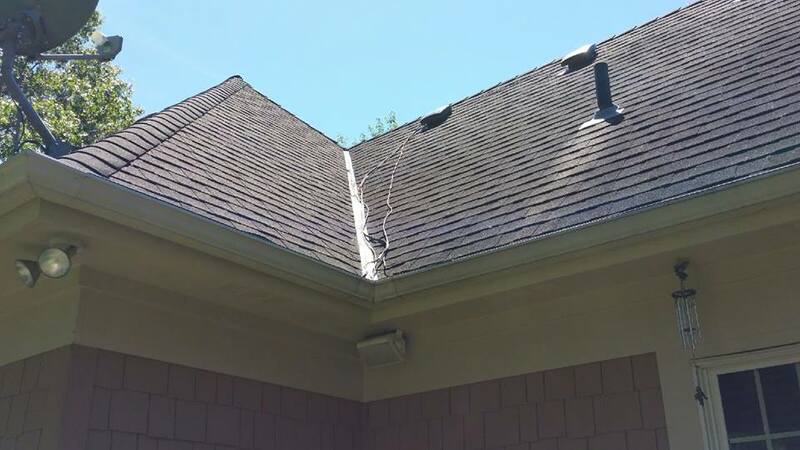 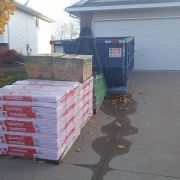 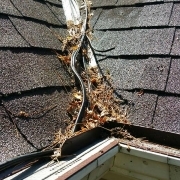 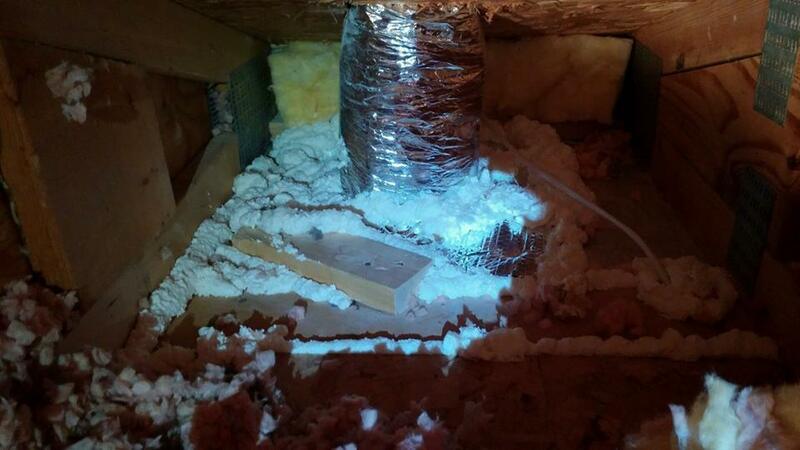 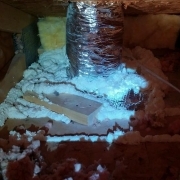 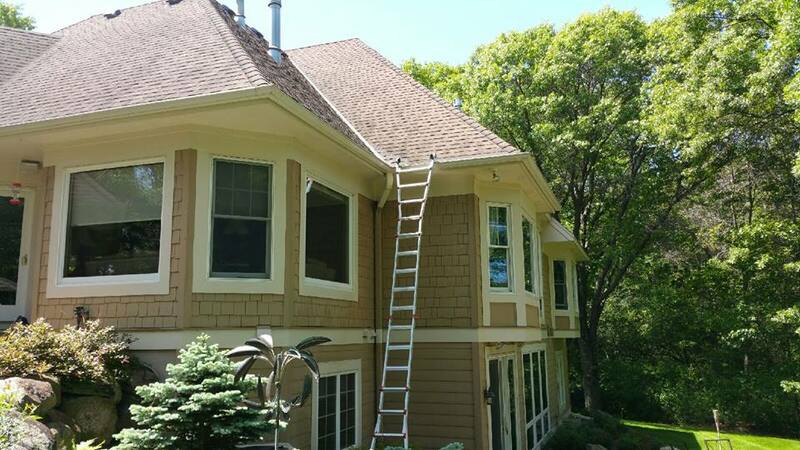 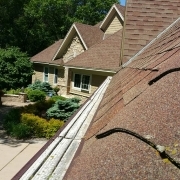 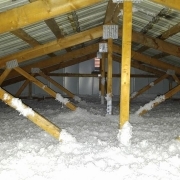 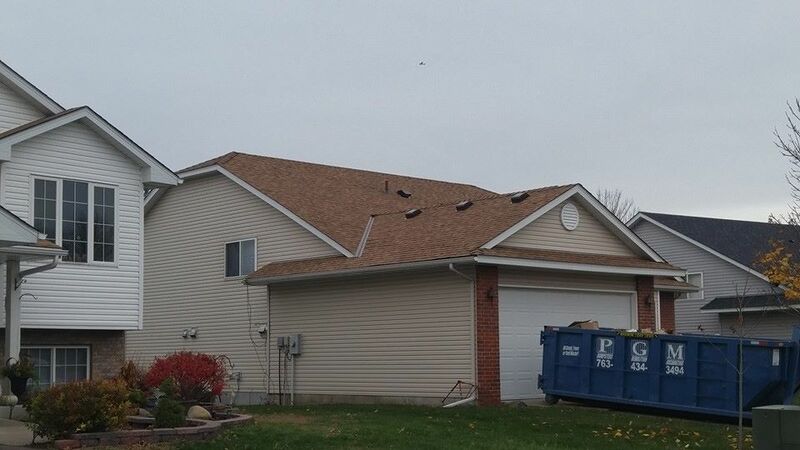 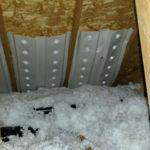 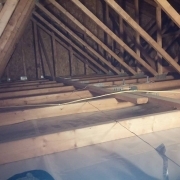 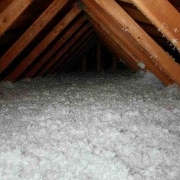 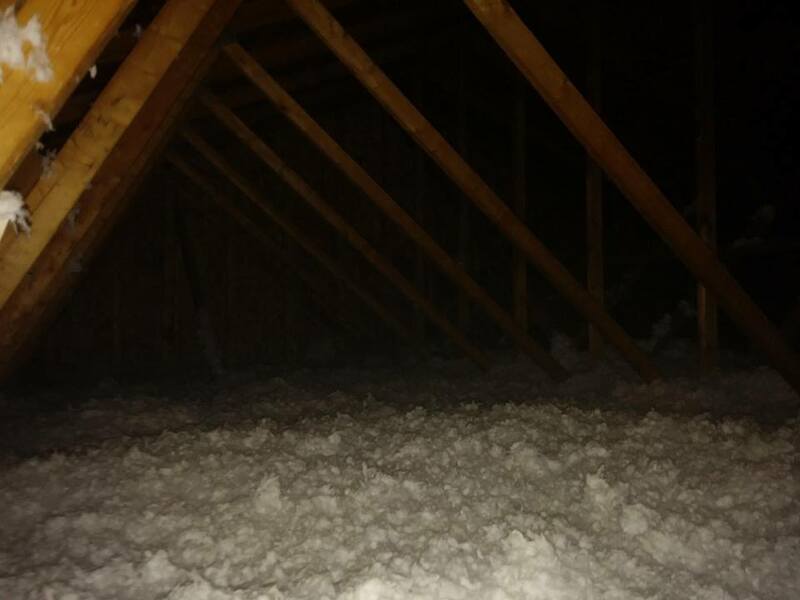 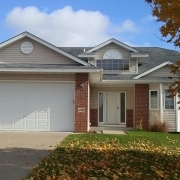 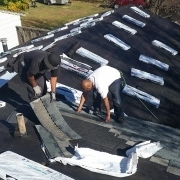 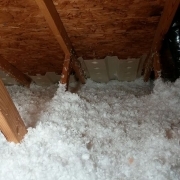 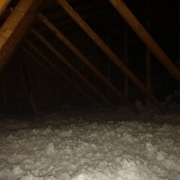 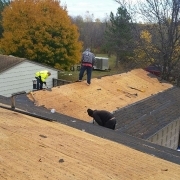 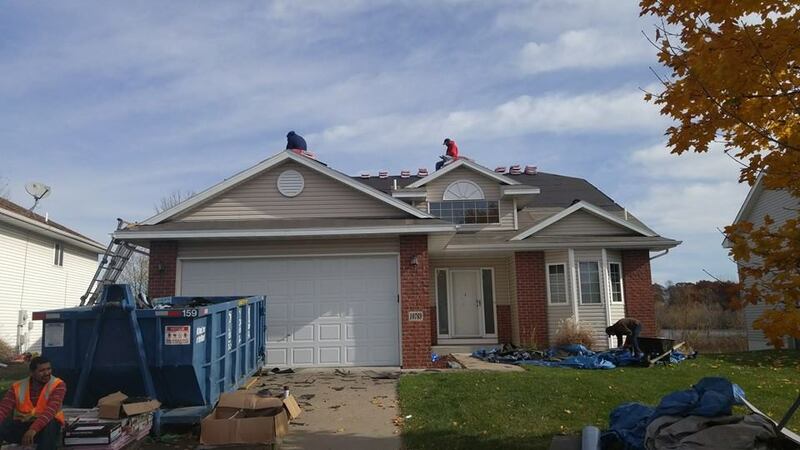 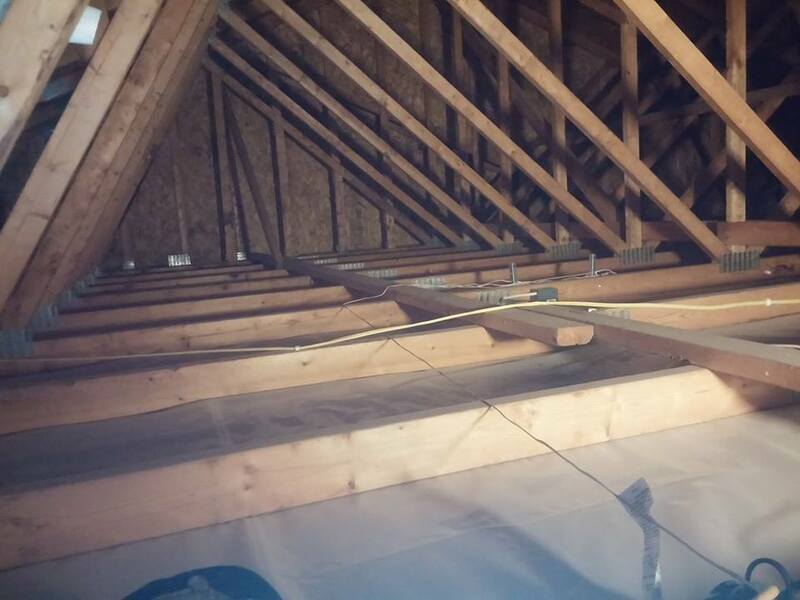 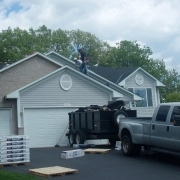 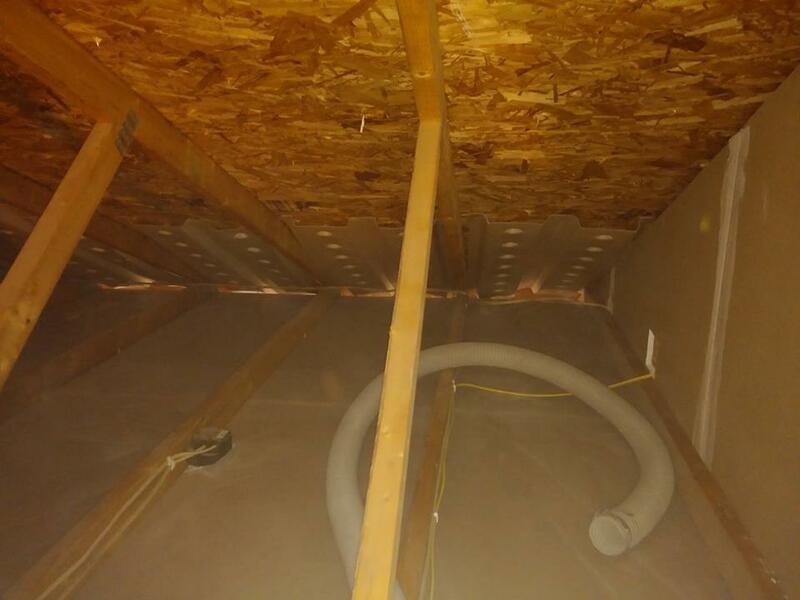 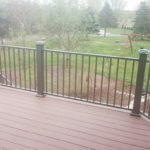 "We did not discover Thunderstruck's business via Angie's List, but we are certainly glad we did get connected. 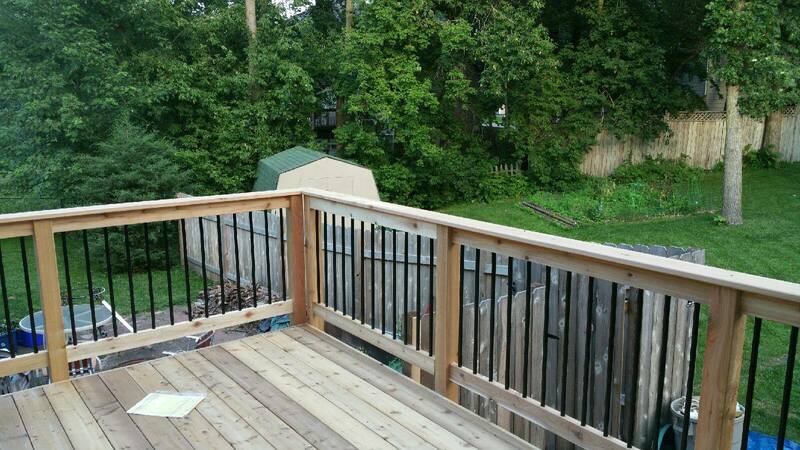 We realized that our deck was past the point of refinishing, and started looking for estimates for replacement in 2015 (or 2016, since it was late July already). 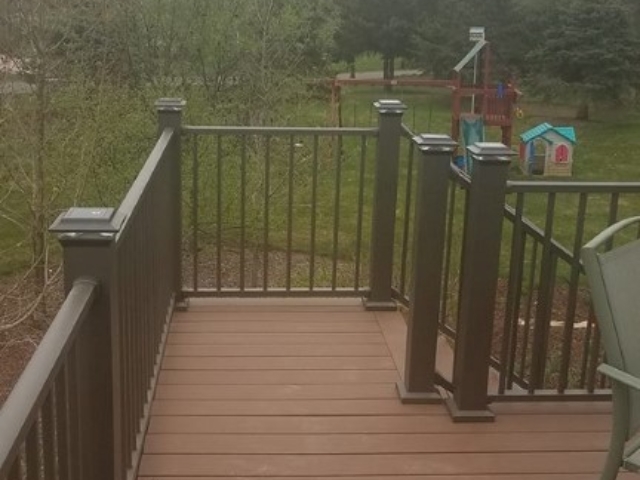 I read about an interesting product online, and it was through a link for that product that they contacted me. 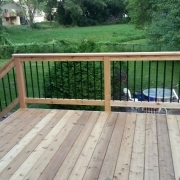 He called and came out on Saturday, August 1, before anyone else I had contacted via Angie's List. 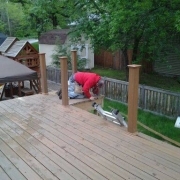 He didn't come out to sell the product, but rather to hear what we wanted in terms of a new deck. 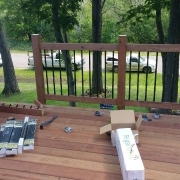 He brought along a variety of decking products, and spent 75 minutes reviewing our thoughts and tossing out ideas. 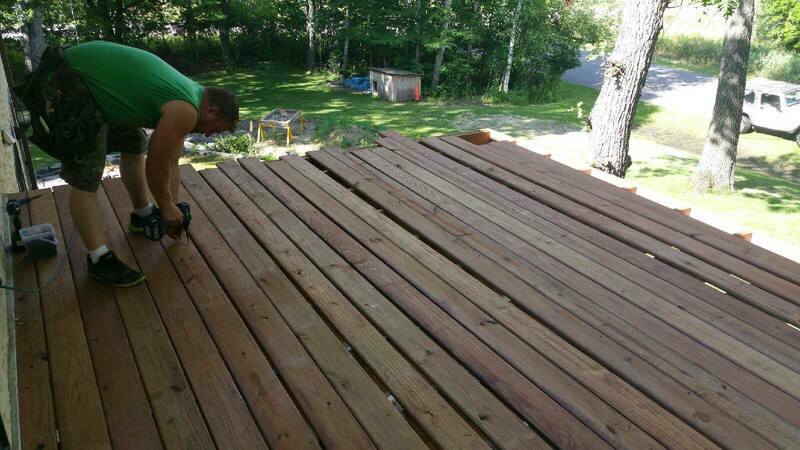 He insisted on leaving samples so we could get a sense of what they are like after sun exposure (some products get awfully hot). 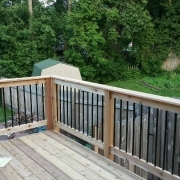 Now, just a month after first contacting him, the project is complete, and it looks great. 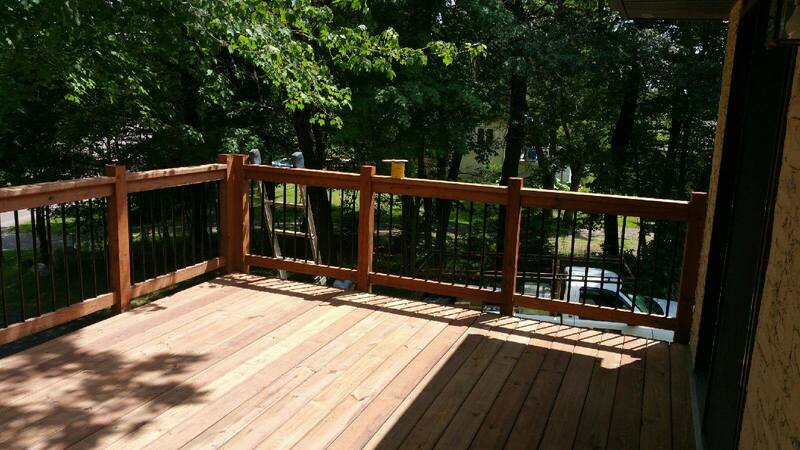 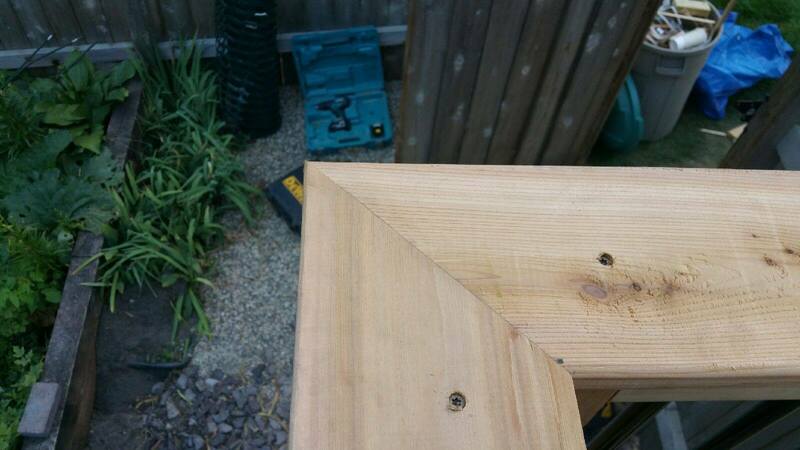 We have a beautiful cedar deck with no-maintenance aluminum Westbury railings, and a cedar drink rail. 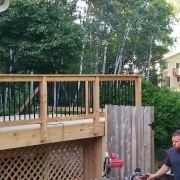 The team was there to keep track and help out as Beau (sp?) 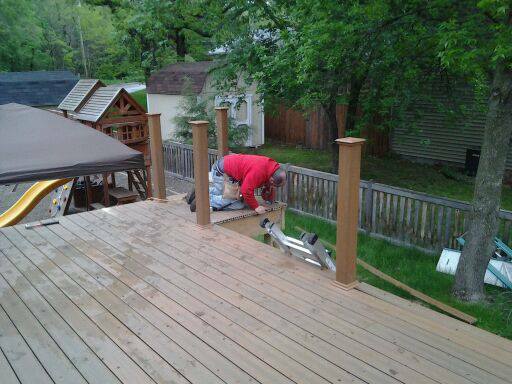 and Rod put things together, and to make sure that we were getting the look we wanted. 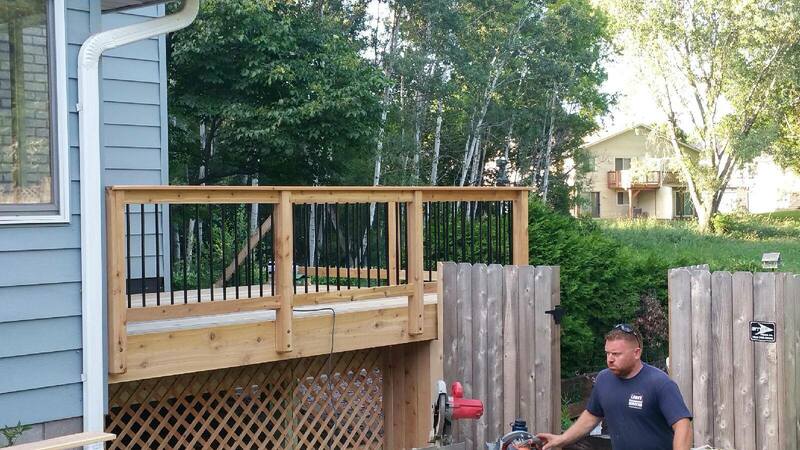 Better yet, Rod made a simple design suggestion that enhanced the look, and Beau did meticulous work. 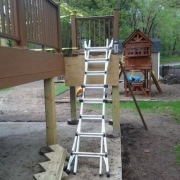 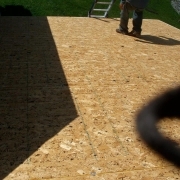 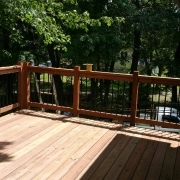 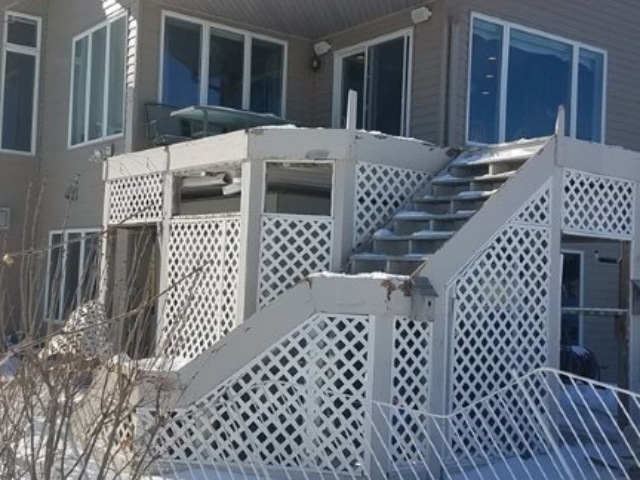 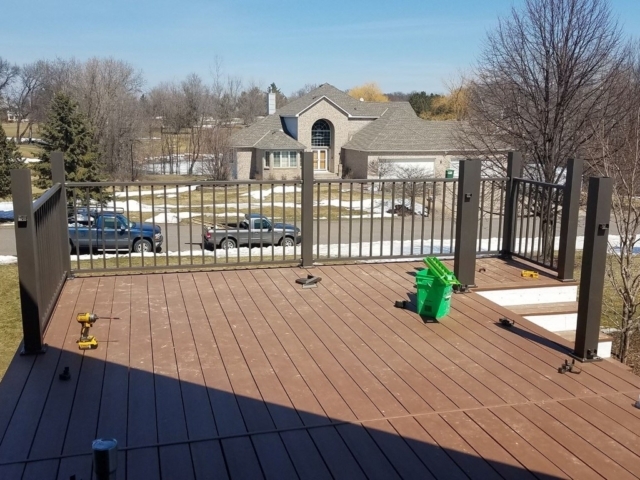 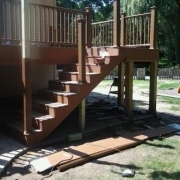 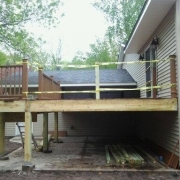 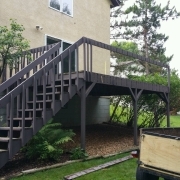 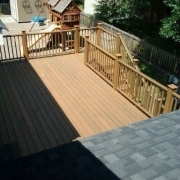 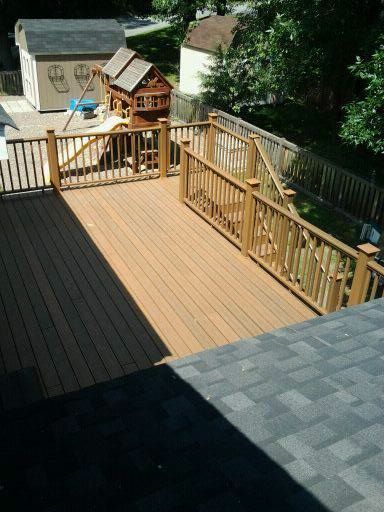 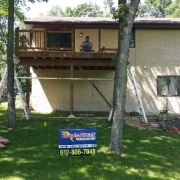 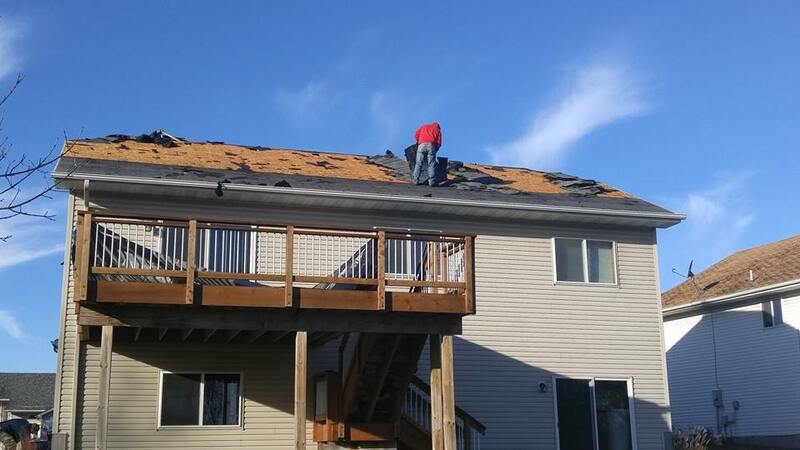 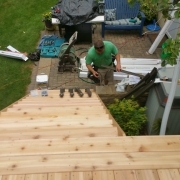 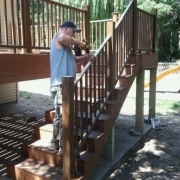 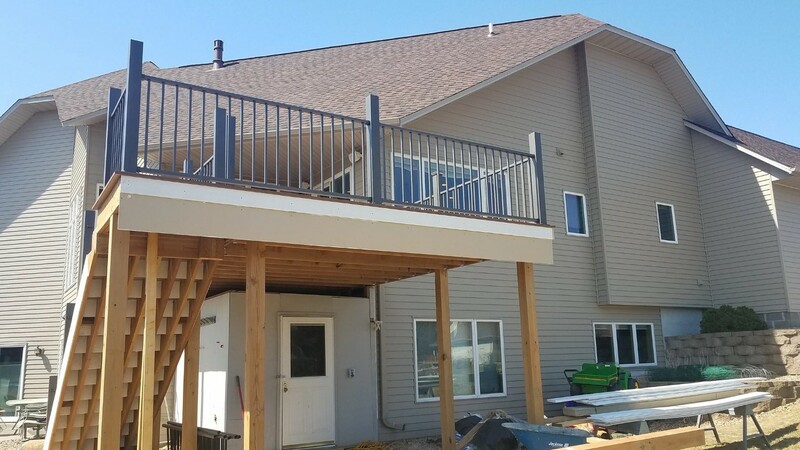 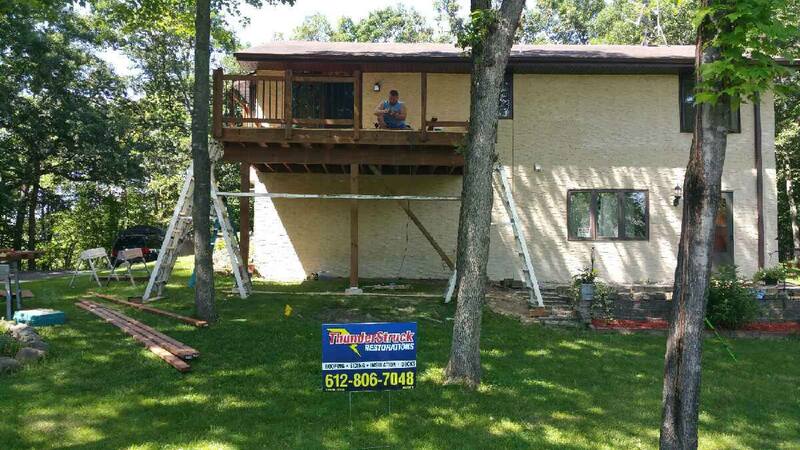 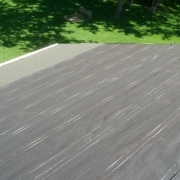 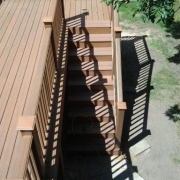 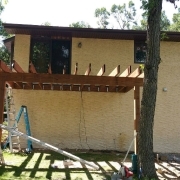 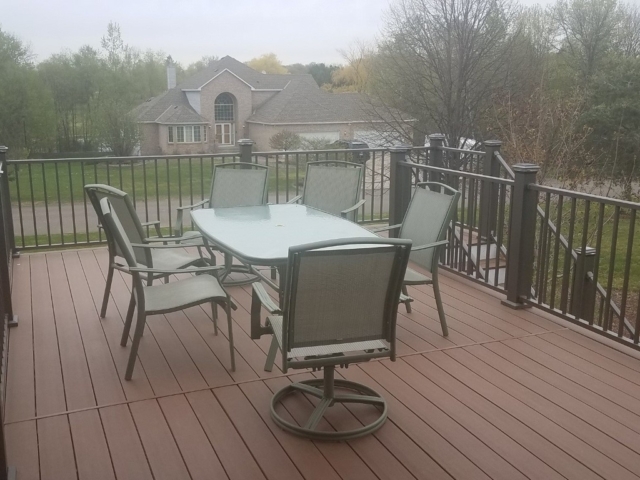 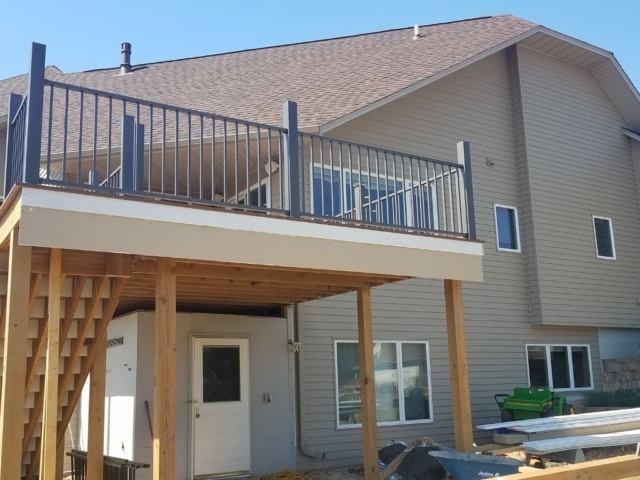 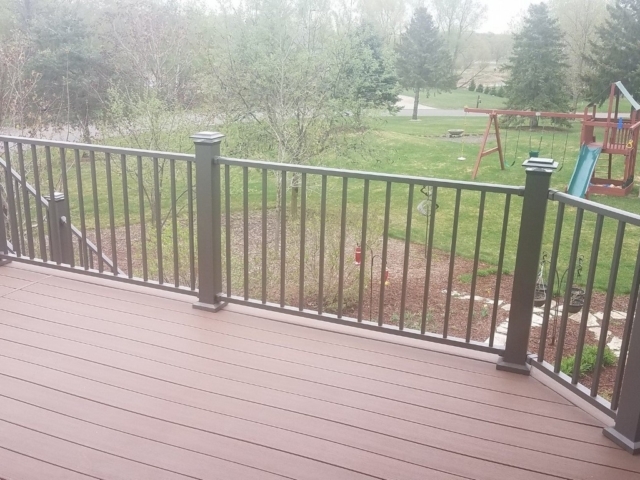 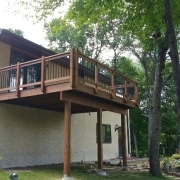 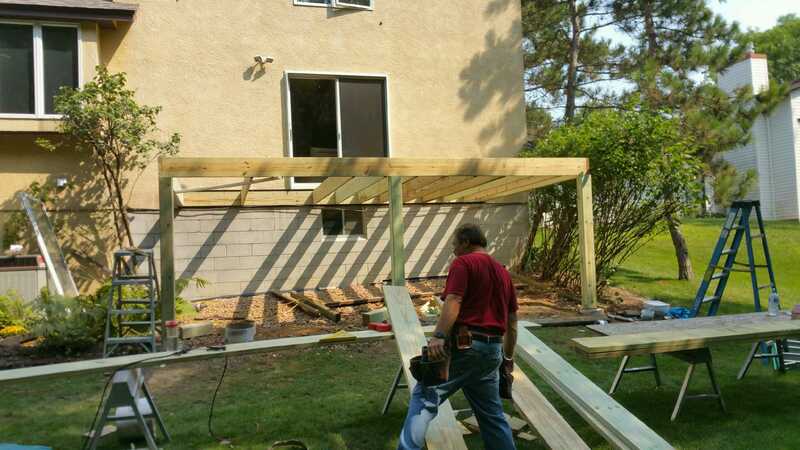 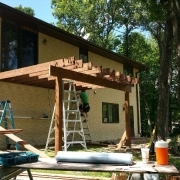 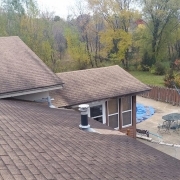 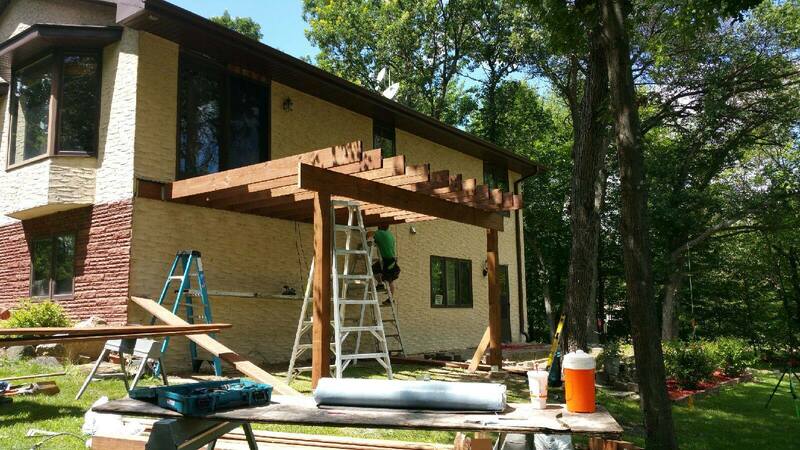 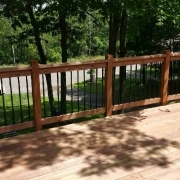 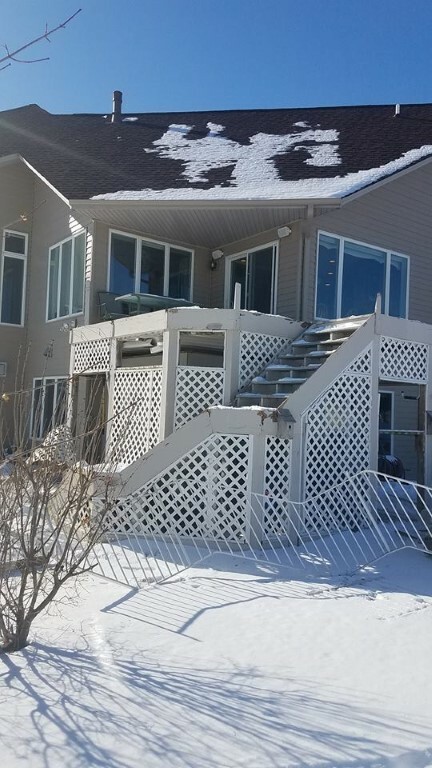 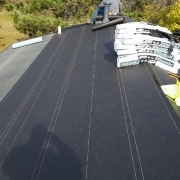 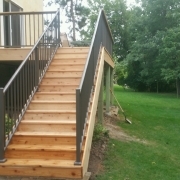 Like I said, we are glad we got connected and recommend them highly"
Deck Information: This deck is 18' x 20' and made with AZEK composite decking material with a maintenance free railing. 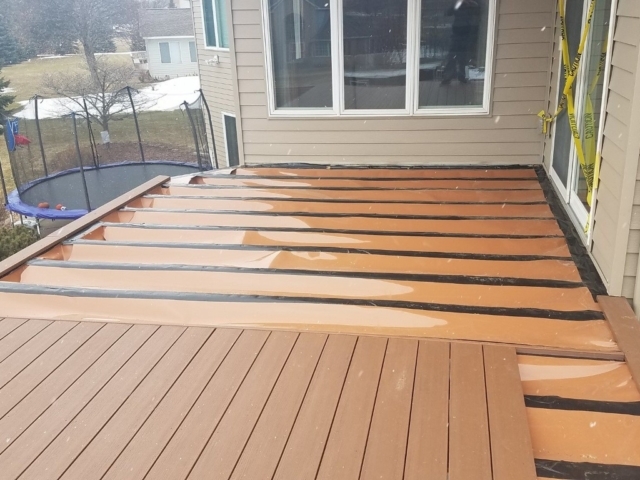 This deck is dark brown in color intentionally to hide any future stains that might happen from lots of foot or pet traffic. 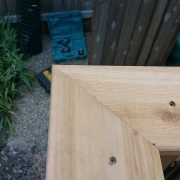 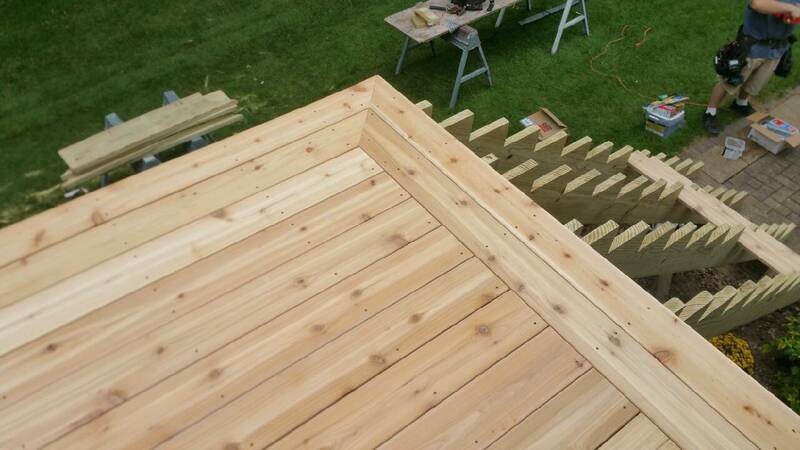 We used the hidden fastening system to secure the decking boards with a seamless appearance. 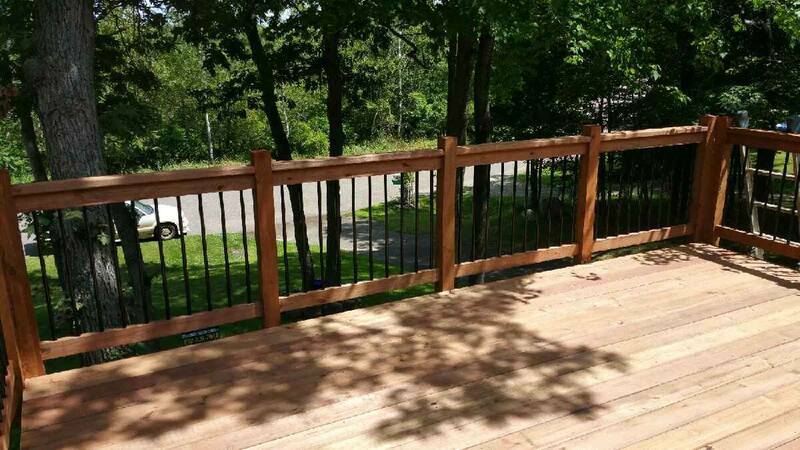 This hidden fastening system let's you eliminate the screw holes on the surface of your high end deck. 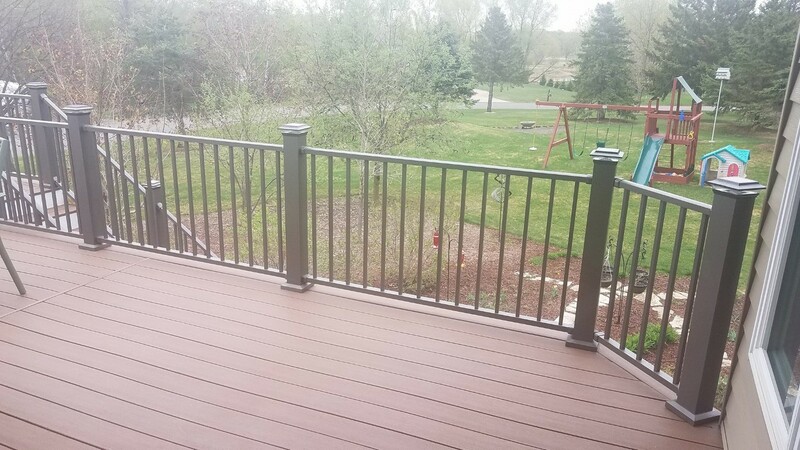 Deck Information: This deck is 12' x 24' and made with AZEK Arbor Collection composite decking material in a Morado color. 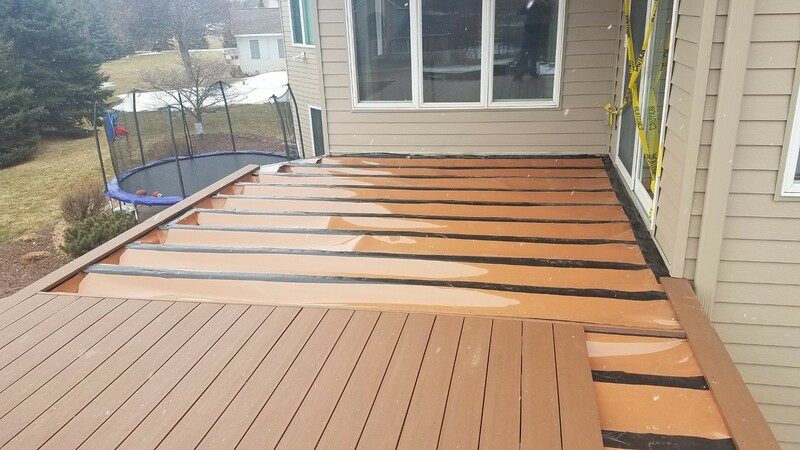 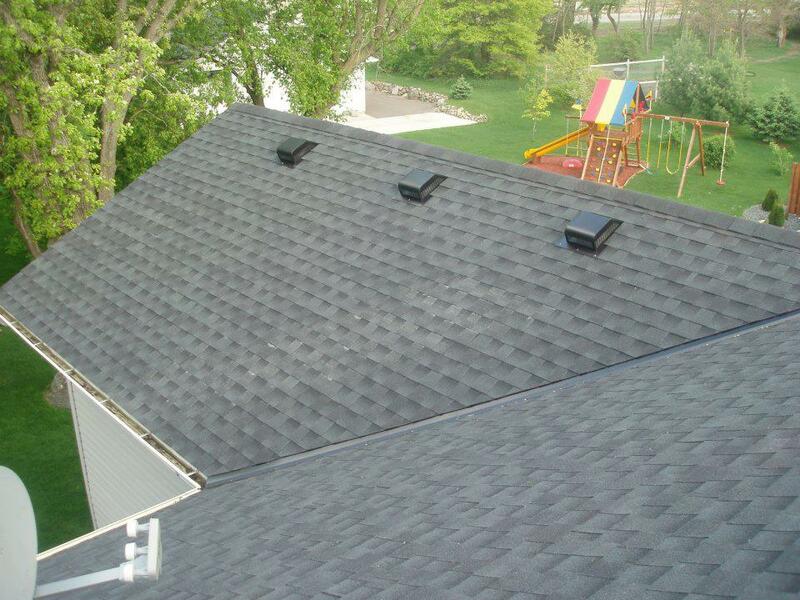 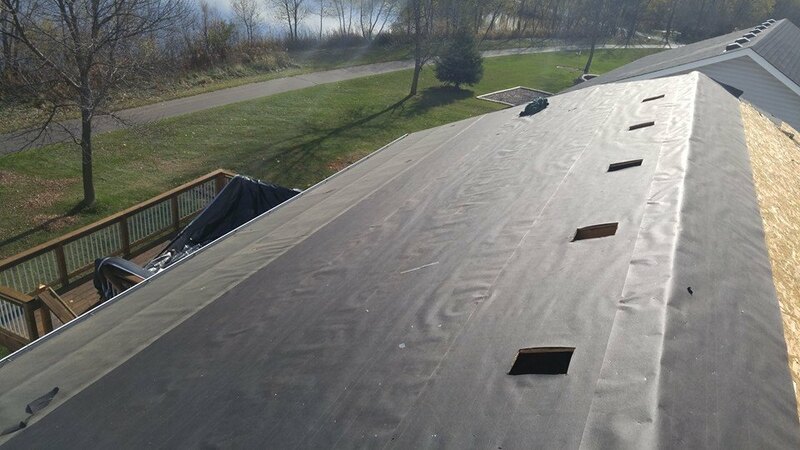 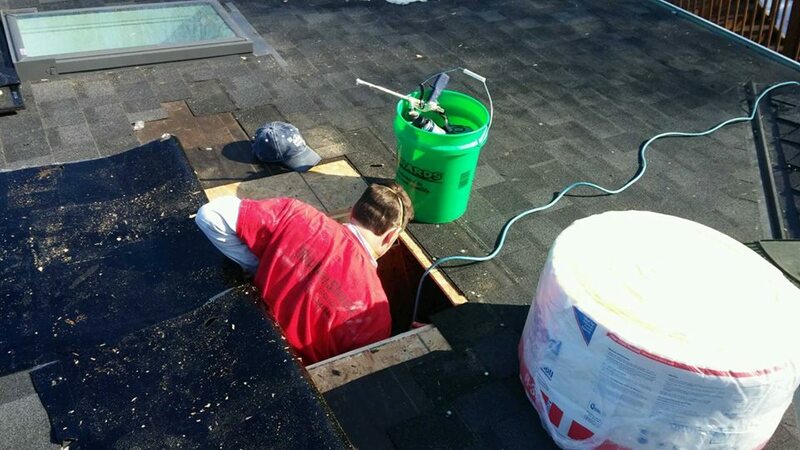 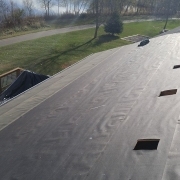 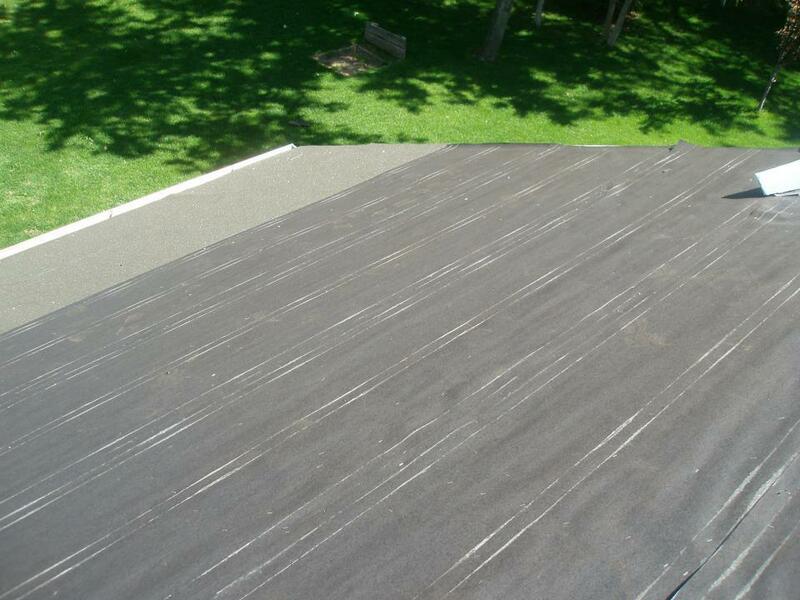 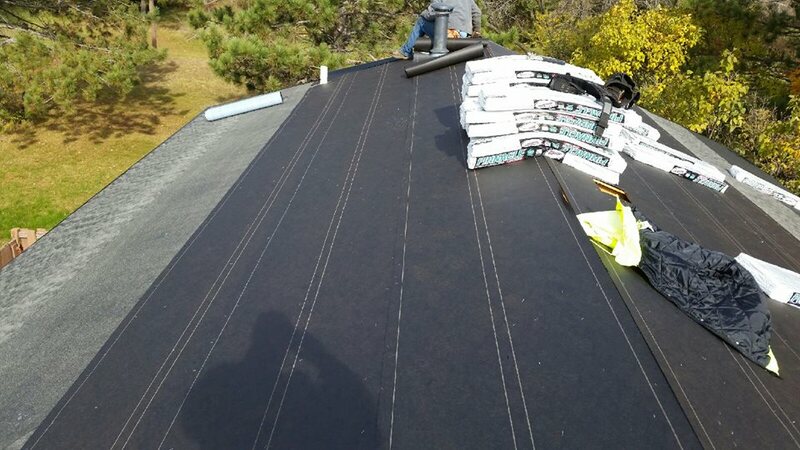 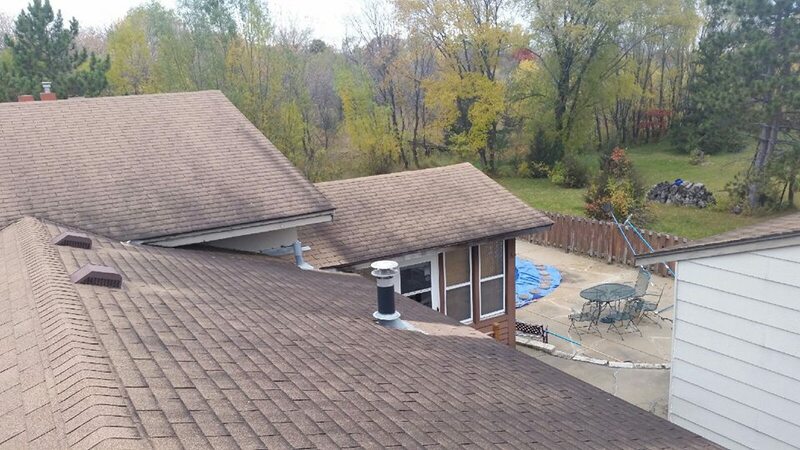 This deck also incorporates the Trex RainEscape system to prevent water from dripping onto the under deck surface. 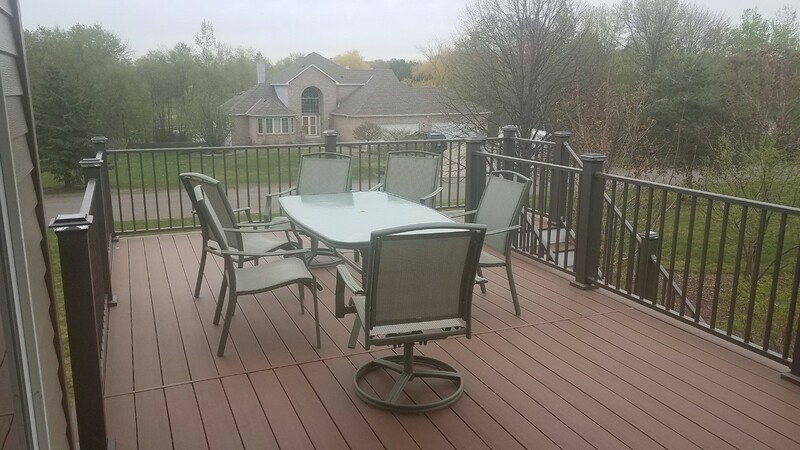 This deck has Westbury Aluminum railings which are maintenance free and feature solar lights in the post caps.